Manipur Public Service Commission (MPSC), Is Inviting Eligible Candidates For 70 Vacant Posts, So Interested People Can Apply For This Job By The 3rd Of February, 2019. Kindly Read Out The Official Notification For Better Information, It's Provided Below. Manipur Civil Service Grade II → 15 Vacancies. Manipur Police Service Grade II→15 Vacancies. Manipur Finance Service Grade II→15 Vacancies. 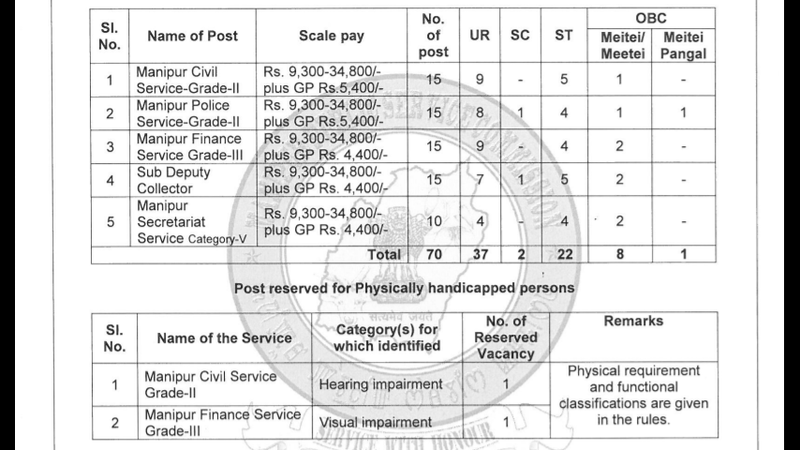 Manipur Secretariat Service Category V→10 Vacancies. Total Number Of Vacancies →70 MPSC Online Vacancies. Age Limit →21 Years To 38 Years As On 1st Of July, 2019, And There Is Age Relaxation For Reserved Candidates As Per Govt. Rules. Educational Qualifications →Candidates Must Hold Atleast A Bachelor Degree From The Certified Board/University. Mode Of Examination/Selection Process →Preliminary/Mains Examination (Manipur Civil Service Exam). Online Application/Examination Fee →₹600 For General/OBC & ₹400 For Other Reserved Candidates, Through Online Payment Mode. Last Date For Online Application Form →3rd Of February, 2019. Admit Card Download →Kindly Check Out The Official Website Regularly For MPSC Admit Card, It's Given Below. Result →Do Visit The Official Website Link Here To Stay Updated,>The Official Website Of Manipur Public Service Commission. Now Apply For MPSC Advertisement 2019, Links Are Below. Do Visit Here For More Information On Government Jobs News Alerts, Till Then Stay Safe And Blessed.